The Berman v. Parker decision established the principle that aesthetics alone sufficiently justified government regulation of private property. Berman and other owners of a department store in Washington, D.C.
Hugo Lafayette Black, Harold Burton, Tom C. Clark, William O. Douglas (writing for the court), Felix Frankfurter, Sherman Minton, Stanley Forman Reed, and Earl Warren. 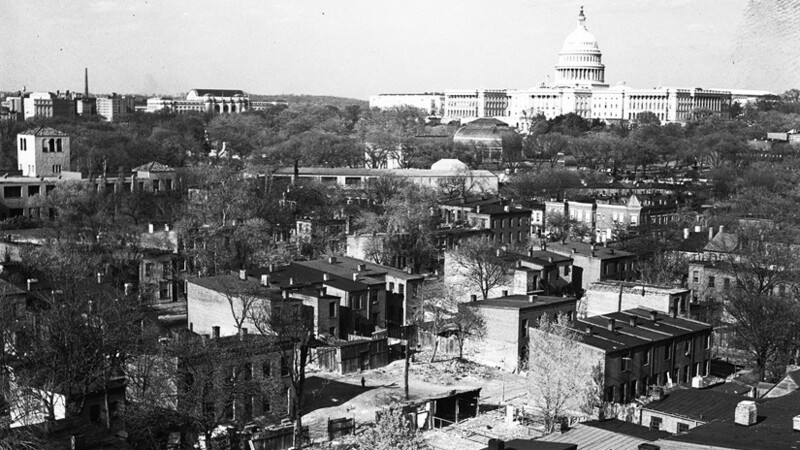 Berman v. Parker involved a slum clearance project in Washington, D.C. Berman, a local businessman, decided to fight against the taking of his property. He argued that though the redevelopment project had been authorized to eradicate “local blight,” this term did not include his thriving business, which was housed in a sound building, and in no way presented a hazard to the public well being. Consequently, Berman argued, in seizing his property, the government had been motivated by an aesthetic impulse, not recognized in the law. The lower courts agreed with Berman, and ruled in his favor. The Supreme Court, however, found that “It is well within the power of the legislature to determine that the community should be beautiful as well as healthy, spacious as well as clean, well balanced as well as carefully patrolled,” and therefore, the government obtained the right to Berman’s property.